Anyone who has ever attempted to research their family history knows that at some point, the trail ends–in other words, you hit the proverbial “brick wall.” Maybe the surname is too common, or maybe the records have not survived (even if you have limited your research to tracing your family in the United States). Perhaps the elders in the family don’t have good (or accurate) recollections of the family history, thus leading you into unrelated rabbit holes. In any case, you get stuck and step away from it, hoping that someday the brick wall will come tumbling down. My last name is Guenther. I have been able to trace the Guenther line (with that surname) back to Germany, where the “first” Guenther, Charles William, was born in 1813 in Hesse-Darmstadt. He came to the United States in the 1840s, married Amelia (Amalia) Crecelius at Trinity Lutheran Church in Reading, and had at least seven children before his death in June 1897. 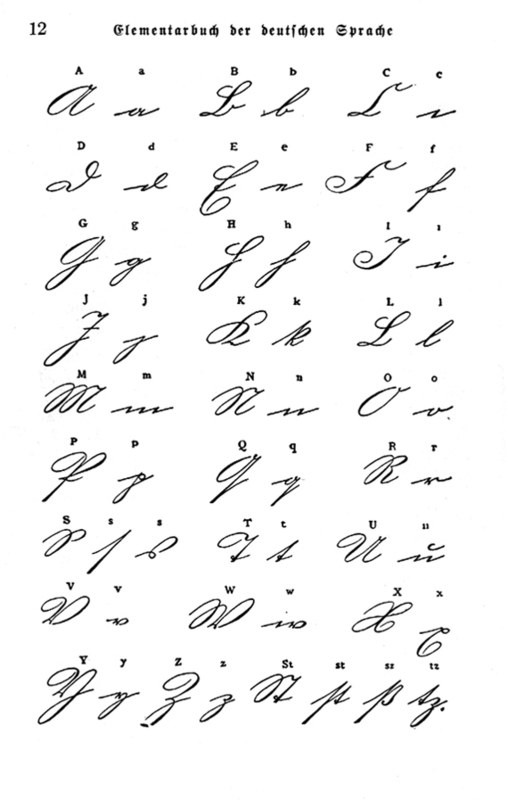 While living in Pennsylvania, he taught German at Reading High School, sold insurance, owned a restaurant, and published German language newspapers, among other occupations. But, according to family lore, he founded Carpenter Steel–which, of course, was founded by James Carpenter, not Charles Guenther. Tracing further back in Germany, however, has proven to be a bit of a challenge, as apparently Guenther is a common name in that region. My great-grandfather, Milton Raymond Guenther (who apparently was called Timmy for some reason), married Clara Edna Miller in early 1903. You would think the Miller name would cause problems–but it’s actually through Clara that some of the brick walls came tumbling down. In this case, it was Clara’s mother, Cinderela (also spelled as Senderella or Rella on census records), who led the breakthrough. This definitely was one case in which having an unusual first name helps tremendously, as I was able to find out her parents’ names and then work back. It turns out that through Cinderela I’m related to two early ministers in Pennsylvania–Reverend Anthony Jacob Henckel, the first Lutheran minister in the colony, and Matthias Bauman, who, following an illness in 1701, began to see visions and founded the “New Born” faith in which he essentially saw himself as the second coming of Christ. My paternal grandmother’s maiden name was Wheeler, which is also a rather common name–until you realize that the German counterpart could be Weiler. Through this line (actually, through Sariah Hassler Wheeler, my great-great-grandmother), I discovered one of my mother’s ancestors “owned” one of my father’s ancestors when Jacob Gehry arrived in Philadelphia in 1739 as an indentured servant and was indentured to Johann Valentine Griesemer (and later married Griesemer’s daughter Anna Margeretha). Sariah’s maiden name was discovered through her obituary, which opened the door to her parents’ names, and then census records, Find a Grave, church records, and family trees on Ancestry.com led me to her parents, grandparents, etc. Sariah’s line has been traced back to the 8th century (770 to be precise) through a rather interesting ancestor; that is the story for another blog. Slowly, as the little leaves on Ancestry.com appear, windows are opening, and the proverbial brick walls are falling down. At the same time, though, I can see how the research can become addictive; I also have violated some of the guidelines I give students by consulting encyclopedias in order to verify information. As I mentioned in a previous blog, I now have a better understanding of why I like ottomans (the piece of furniture); with these new discoveries, I’m also finding out why learning Spanish might tie in with my heritage. I’m still stuck, though, on some of the findings that have come from my mother and I doing the Ancestry DNA testing; I sort of have figured out the 33% Scandinavian for her side (Yoders! ), but we’re both stumped on the 6% (me) and 17% (my mother) Irish ancestry. One thing is certain; we both don’t think it comes from one of her aunts marrying a Fitzgerald. (1) The semester after a sabbatical is a bit strange. It’s not just getting back into the routine of teaching classes; it’s more like taking an extended nap for a few months and then waking up in a classroom full of students who are eager to learn. I will admit, though, that I enjoyed going into the secretary’s office at the beginning of the semester and telling her that I wanted my advisees back (they had been split among the other three history faculty members while I was on sabbatical). (2) Technology can be both wonderful and infuriating. This semester, I filmed all of the lectures for the HST 2202 (United States History since 1877) class that was taught on campus. The purpose was twofold: Students who were enrolled in the online section of the same course would see the same information I was teaching on campus, and students who missed class for a variety of reasons (athletic trips, illness, reserve duty, etc.) could watch the lectures and “catch up” on what they missed. Most of the time, the lectures were filmed with my cell phone on a tripod, and the video quality was quite good—as was the audio most of the semester. However, once the weather warmed up, the fan in the classroom ran all the time—and thus the cell phone picked up the fan noise in addition to me talking (previously, the heater shut off when class began and came back on when class ended—it must have been on a timer). Fortunately, by that point the instructional designer had installed a camera in the classroom, so the last couple of weeks we filmed with both the cell phone and the “real” camera (with me wearing a microphone). Of course, that didn’t go without its own glitches…some of which I discussed in a presentation on using technology in the classroom after the semester ended. (3) Being an administrator can be both fun and exasperating. I would have loved to do more than I did, but for various reasons I was limited in what I could accomplish. I did complete all of my assigned tasks (coordinate Faculty Work-in-Progress Speaker Series, assist with Showcase of Student Scholarship, explore restoration of post-baccalaureate certification). For the former, I handled all of the promotions for the talks, which attracted between five to ten people at the presentations. Another faculty member handled the arrangements for the Showcase, but I did compile a list of suggestions for next year’s event to get more participation (including promoting it during the fall semester, not just during the spring). And, for the latter, I got to use my skills as an historian to investigate how and why post-baccalaureate certification was eliminated before researching how to reinstate it. It turns out that it was an administrative decision, one that obviously was made in error (or maybe it’s just coincidental that enrollments dropped about 50% in the education programs after its elimination). So now the post-baccalaureate certification has returned, and it’s just a matter of time before new students are enrolled in the program. But I did enjoy the experience, and I am planning on continuing in the position this fall. (4) I miss observing student teachers. We had two this academic year, one each semester. Of course, I didn’t supervise one while I was on sabbatical in the fall, and my administrative responsibilities prevented me from supervising in the spring. I have received permission to supervise one of the three student teachers we’ll have in the fall, and I’m looking forward to doing it again. There is something about seeing the students who I have taught succeed in the classroom. (5) Students still amaze me. One in particular in the capstone course decided that she (a) didn’t need to do a rough draft of her research paper and instead turned in a topical outline, with the explanation that she had a lot of work for other classes and didn’t have time to do it; (b) would turn in a research paper that was half of the minimum required length, poorly cited (as in the citations were severely lacking and in the wrong format), and then question why it received a failing grade; and (c) thought it was more important to leave the last class meeting—during which I would discuss information that was on the final exam—after the first twenty minutes because she had an organization meeting to attend. Then there was the one who argued with me (via email and in person) about how unreasonable it was of me to expect him to follow directions and not plagiarize on a take-home exam, with the explanation that since it was an online course he should be allowed to copy information from the Internet for his exam answers. Finally, there was the student who left a phone message after the final exam was due on May 9 in which she stated that she had been unable to get in touch with me but needed me to sign her late withdrawal slip (the last day to withdraw from the course was March 28). Apparently she didn’t realize that if she had come to class at all after spring break, she could have easily found me to sign her form. L. Frank Baum: Wrote the “Wizard of Oz”. This was a parabola on populism with the characters and scenes representing different people and events in the time. The assignation of president James Garfield led to the placement of the Pendleton Civil Service Reform Act. Garfield did not believe in the spoiler system and was assonated by a angry office seeker. Because of this vise president Chester Author was able to pass the civil service reform act. Roosevelt Corollary- Corollary spent time in the west and he announced conservation of water is of importance under the department of agriculture (hydroelectric power). Kent State was segregation was not accepted at a University and shots were fired, students were killed, protesting was on, and the governor ordered the national guard to clean up the mess. Henry Melchior Muhlenberg was a German religious leader who was sent to America around the time of Protestant reform. He went around asking for money, pleading for help and preaching about reform, but his pleas for contribution fell on deaf ears. This was one of the problems with the Protestant Reform. As a side note, I will allow you, the reader to read on more through the paper to fully understand what I have introduced in this paragraph. (7) I love my job. I love working with students. I’m doing what I was trained to do, and I’m doing it at a place I really like. Sometimes it gets frustrating, but most of the time I enjoy it. I don’t think I truly appreciated it until after I took a semester off for research (and, as it turned out, other things). My next goal is to figure out a way I can better serve the university and help it deal with the financial constraints that result from being part of public higher education in a state where the governor doesn’t appreciate its value and where the cost of higher education is reaching the point that it’s not affordable to the middle class. Fortunately, I’ll be able to do it again this summer, and I will be continuing to serve as a ¼ time administrator (Faculty Associate/Assistant to the Provost) in the fall. I’m back on committees, serving on the Sabbatical Committee (again) and on the Academic Planning Committee; the latter will see a couple of program changes from me this fall as I modify the Public History concentration (which now has a major!) to match current curricular offerings and develop a Social Studies Education concentration in the B.A. History for students who wish to pursue post-baccalaureate certification as social studies teachers. 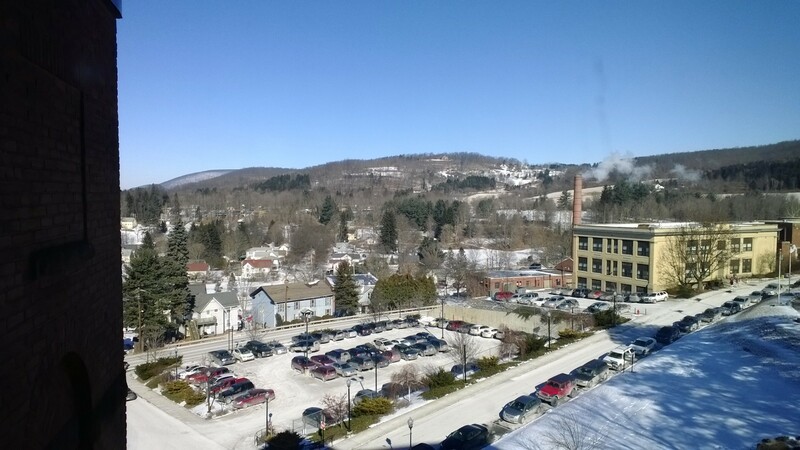 Last week, I began my appointment as Faculty Associate/Assistant Provost at Mansfield University. My primary duties in this position will include coordinating the Faculty Work-in-Progress Speaker Series for spring semester, assisting with the annual Showcase of Student Scholarship, and working with the Department of Education and Special Education and the Associate Provost/Interim Dean of Faculty in the development of new curricula and delivery options, along with the usual “other duties as assigned” (I’m already aware of one of these other duties, and hopefully another will be added in the near future). One of my tasks, then, is to resurrect the post-baccalaureate certification program that was eliminated a few years ago (since then, there has been an approximately 50% decrease in graduate enrollment–perhaps just a coincidence, but I suspect there may be a correlation). For instance, prior to the elimination of the PB certification program in social studies, we had between 10-12 student teachers a year; this academic year, we will have two, one each semester. Resurrecting the post-baccalaureate certification program(s) will involve research (yay!) into how other 5th year/post-baccalaureate certification programs within PASSHE (and perhaps outside) operate and perhaps inquire about issues they have faced in creating and maintaining the program. I am excited to have this opportunity to bring back a program that attracted students and produced high quality teachers. The benefit of a post-baccalaureate certification program in social studies (in which students are certified to teach seven subjects: history, civics and government, geography, economics, psychology, sociology, and anthropology) is that students’ content knowledge would be much stronger if students completed a major in history and a minor in one or more of the other social studies content areas and then pursued teaching certification as part of a graduate program. Some universities in PASSHE, such as Slippery Rock, already have a 5th year certification program in place, which means that Mansfield will not be doing something that discourages prospective students but instead would help them become better teachers (and hopefully not tell their students that there are 52 states). Plus, students have found the new pre-gate exam, PAPA, to be a bit challenging (to put it mildly–but at least our 39% pass rate is among the highest in PASSHE), and shifting to a post-baccalaureate program eliminates that as a barrier to student advancement in the teacher education program (currently, they must pass all 3 parts of PAPA–reading, writing, and math–before enrolling in any upper level Education or Special Education courses). As a part-time (technically, 1/4 time) administrator, I am also learning that there are some things that I am not allowed to know or discuss because of confidentiality issues. After all, I am still 3/4 faculty, and I’m guessing that they don’t want to trust me or the other faculty associates with state secrets yet (maybe they do realize that I write a blog!). I have no control or input over budgetary issues; I cannot handle any problems with staff or faculty (including complaints); and I almost have to take a vow of silence–or, more accurately, emulate Sgt. Schultz from Hogan’s Heroes and say I know nothing. To paraphrase, what happens on the 5th floor (where the administration is located) stays on the 5th floor. I have found out, however, that when it comes to snow days, I am not considered an essential employee (yay!). Now I just have to find out if my new position also means that I have have to censor what I write in my blogs–and, if so, how I can find a way to vent my frustrations when I start grading assignments and exams again. Almost three years ago, I wrote a blog on how instructional technology has changed (or evolved) since I first taught a college course in Spring 1986 (or since I had a week’s training in “instructional technology” in my one secondary education course when I was an undergraduate at Stephen F. Austin State University in Fall 1979) (here is the link to the previous blog: https://historyeducator.wordpress.com/2011/02/02/technology-and-teaching/). 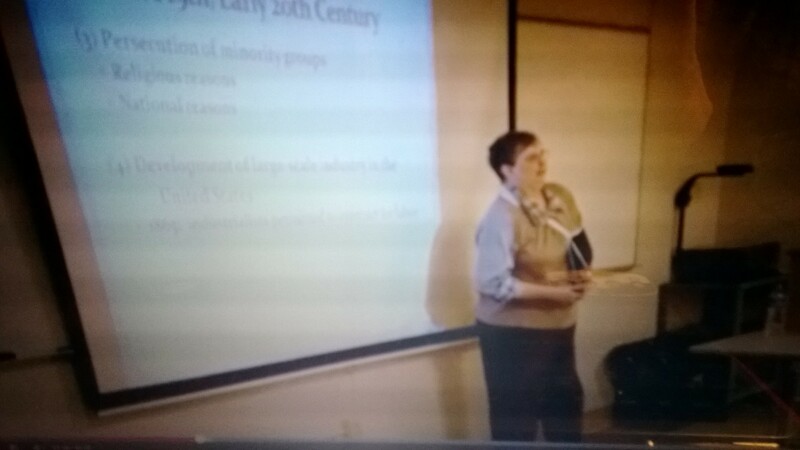 Since then, I have begun recording some of the lectures for HST 2201 (United States History to 1877), all of the lectures for HST 2202 (United States History since 1877), and most of the lectures for HST 4401 (History of Pennsylvania) using a flip camera. While the flip camera is easy to use, there are issues inherent with using it for a “professional” presentation, namely that it’s placed on a window sill, aimed toward the projection screen, and picks up all ambient noises ranging from students talking (which isn’t always a bad thing), to the sound of the heater/air conditioner running below the window sill (which can be quite loud at times when it works) or the noise of a lawnmower or traffic outside the classroom when the windows are open. Plus, because it’s a fixed camera, I’m not always seen in the video—which isn’t necessarily a bad thing, but it’s certainly not as engaging as I would like. The relatively medium-to-low quality of the film wouldn’t be a problem except that I also use the filmed lectures in the online version of HST 2202 (students physically aren’t in the classroom when I lecture, so they get to see/hear what the students in the room do). One student commented on the online course evaluation last spring that he/she had some difficulty listening to the first lecture and didn’t watch the rest of them, so I’ve decided to fix that problem. This spring, when I teach the course again, students will be required to watch the lectures for the course “attendance” grade (yes, I know, they can just play it and not pay attention, but honestly that’s not a lot different from students who sit in the classroom texting or playing games on their cell phones while I’m lecturing). The other change: I’m doing a more professional presentation of the immigration lecture that was the focus of the previous blog as a test to find out if it better serves students’ learning needs. As an aside, there are a couple of reasons why I started recording the lectures. First, during the 2011 spring semester, we had four snow days during which the university closed—and thus classes weren’t held. Recording lectures and making them available through the university’s course management system (Desire2Learn) means that students won’t miss a day of instruction if we have a snow day. Plus, I can make them available for students to review when preparing their take-home examinations. Second, when I saw Charles Shaughnessy following his performance as Professor Henry Higgins in My Fair Lady in June 2011, he asked if I had a video of the lecture—which, of course, I did not. 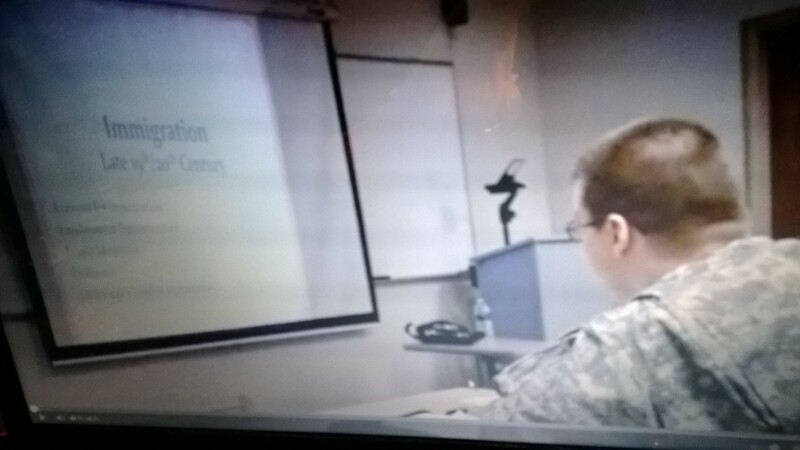 So in February 2012 when the lecture was presented again, it was recorded with the flip camera—and, while the quality is adequate, it really wasn’t as good as I would have liked to share with someone who is a professional actor/producer (although I did still share it with him). I filmed it again in February 2013, but in that version I’m strolling around the classroom with my left arm in a sling while recovering from shoulder surgery…so that’s not exactly a version I want to show very often. Since then, I have wanted to redo this lecture with a “real” video camera…which I am getting to do this fall. And, as it turns out, I get to do it with two cameras. Since the first attempt in February 2012, Mansfield University has hired a new instructional designer, Nick André. Nick has been very helpful in making the video something that is professional in quality (certainly more professional than a flip camera on the window sill). We booked a classroom to film the lecture with multiple cameras (including one that followed me as I paced around the room), adjusted the lighting, and provided me with a microphone to enhance the audio (just in case—my voice usually projects well enough that I don’t need any help to reach the back of the room—and, in fact, it sometimes was too loud, which we had to adjust in post-production). And, when I stumbled over words, we stopped filming and started over—something I really don’t get to do when I’m teaching. 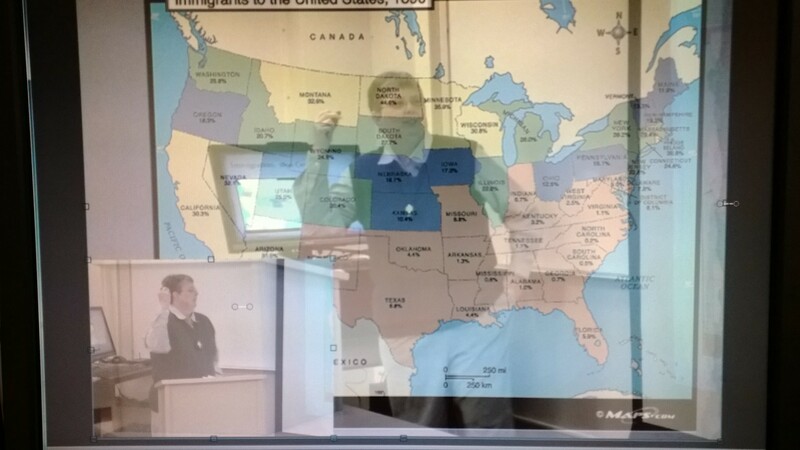 What happens when images from both cameras appear…along with the fixed image of the PowerPoint in the background. Then we started the process of post-production. Just after one morning (during which we worked on 8 minutes of video; the entire lecture has been divided into five installments), I really began to appreciate the time involved in transforming a simple “let’s shoot a home movie” into “let’s produce something that can contend for an Academy Award” (and no, I have no delusions that this lecture video will ever win any awards). We used Camtasia during the editing process, which involved animation (such as drawing arrows on maps to provide more specific locations–stuff that I would have used a pointer in class), inserting media into the video (which alerts students/viewers to click on the web link and access additional information), working with separate tracks for the PowerPoint presentation and the audio portion of the lecture, inserting me into the image (video of me talking in the corner overlaid over the PowerPoint slide), and developing ways to get anonymous student/viewer feedback. Phrases like “transition to fade,” “line up the tracks,” “right click on the pan handle,” “scrub the video,” and “callouts” are becoming part of my vocabulary, and, unfortunately, I have started watching television shows and feature films and focusing on the production qualities instead of the story line (which I’m afraid will happen with the lecture—the students will be so engrossed in the gadgetry that they don’t pay attention to the content—although I have found a solution to that problem). I have also started to rethink how I present the information on the PowerPoint slides; in the future, I will try to make sure that the content is concentrated on the top half of the slide, with the bottom section clear for the insertion of the camera footage of me speaking (and, occasionally, pacing around the front of the classroom). I should have taken the photo of another frame…but you get the basic idea. In the beginning, I was watching Nick work with the first part, which essentially is an overview of immigration in the late 19th century. As we were working on it, we began to think about how to improve it. The nice thing about editing that I’ve found out is that you can have do-overs that you don’t get when presenting the lecture in the classroom (we also re-filmed the last portion, as I realized after stopping that, unlike when I’m actually teaching the class, I do have time to talk after the audio clip plays). The entire film ended up being around 50 minutes—just like a regular class—except the 50 minutes will be divided into smaller segments centered around the content provided (e.g., one section will deal with the transatlantic crossing and processing through Ellis Island; that will be the “Coming to America” section and will fall between the “Reasons for Immigration” and “Employment Opportunities” sections). It will conclude with credits (just like a real production) where I can list credits for illustrations, properly thank those who helped with the project, and include some music to play while the credits are “rolling” that fits into the theme of the lecture. Photo credits, Map credits, and Credits for the audio clip…with “Blue Danube” playing softly in the background as the credits roll. 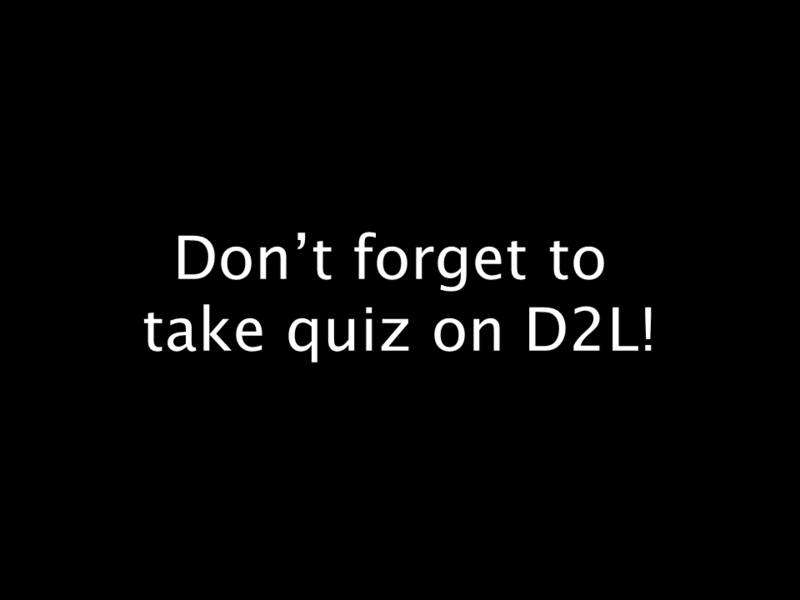 The videos have been posted on You Tube (they’re set up in a playlist) and will be posted on the Desire2Learn course site for both the on campus and online sections of HST 2202. Hyperlinks to information are embedded in the You Tube videos using Pretty Links; I have set up a WordPress.org account (which is slightly different from the WordPress.com account where this blog is posted) to use for creating the links. 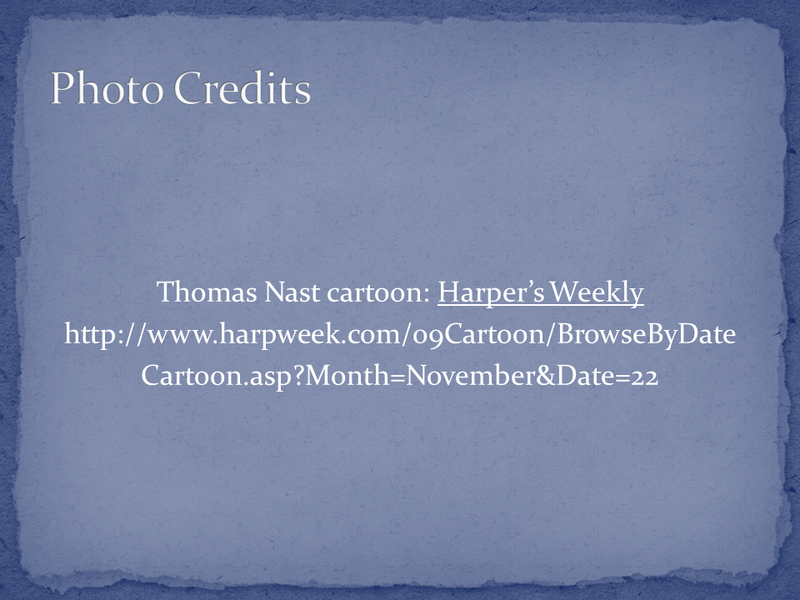 The WordPress.org account has been established as an “Associated Website” on You Tube, and Pretty Links enables me to redirect from WordPress to another website (such as a seamless transition to a biography of Thomas Nast when a student clicks on the red web link logo in the corner of the Thomas Nast cartoon). And, of course, since the links are included in the video of a lecture, the students should expect to be assessed on the information included in the video along with information in the websites they are supposed to access. 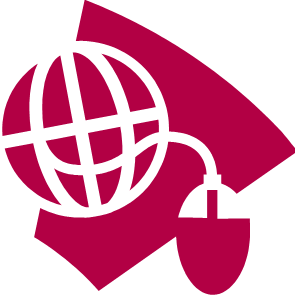 Located on the bottom right corner of the image, the red web link logo will alert students that they can click on the logo to access additional information. The best part, though, is that it will be a far more professional production that might become part of the Legacy Library on the MU YouTube Channel (and thus will be available to prospective students who are interested in seeing the type of engaging instructors we have here at Mansfield). Fortunately, I already have all of the permissions I need (in writing), which is important because the lecture continues to include the original audio clip that led to the whole “let’s bring another voice into the classroom” experience back in February 2011—only this time, the students will be able to click on the red logo in the corner and access additional information on the guest speaker—and they will be tested on that information. If you are interested in viewing the finished product, send me an email at kguenthe@mansfield.edu. As evening approached, the disciples came to him and said, “This is a remote place, and it’s already getting late. Send the crowds away, so they can go to the villages and buy themselves some food.” Jesus replied, “They do not need to go away. You give them something to eat.” “We have here only five loaves of bread and two fish,” they answered. “Bring them here to me,” he said. And he directed the people to sit down on the grass. Taking the five loaves and the two fish and looking up to heaven, he gave thanks and broke the loaves. Then he gave them to the disciples, and the disciples gave them to the people. They all ate and were satisfied, and the disciples picked up twelve basketfuls of broken pieces that were left over. The number of those who ate was about five thousand men, besides women and children. Food and religion have been intertwined ever since Adam took a bite of the forbidden apple (Genesis 3:6, NIV). From mandatory fish on Fridays during Lent for Roman Catholics to no meat for Hindus and Buddhists to Jews not eating pork (or having meat and dairy at the same meal), religious groups have used dietary restrictions as a means to reinforce faith. At the same time, though, church dinners have also traditionally been an effective way (particularly for Protestant denominations) to generate revenue and to provide a service to a local community. One thing about researching the history of a congregation is that I find a variety of ways the church raised money to fund its financial obligations. Typically, people think that weekly offerings are sufficient to cover the church’s expenses, but that seldom is the case. During the colonial period, for instance, clergy often preached at multiple congregations unless they were fortunate enough to work in a town—and even then, they might serve more than one congregation, as the parishioners seldom contributed enough funds to support a minister’s family. Consequently, Zion’s used a variety of methods to raise funds to pay the minister’s salary (and the choir director, organist, etc. ), meet its charitable obligations, pay for utilities, etc. When I was a member while in graduate school, one of the big fundraisers was the rummage sale, during which the church in a sense performed a mission to financially distressed residents of Reading by selling inexpensive used (but in good shape) clothing. Probably the best known way that the church raised funds, however, was through food sales, such as the soup sales that often accompanied the rummage sale. During the 1940s, however, these fundraisers had an entirely different purpose. Details of Chicken Pattie Supper, October 1941. I wonder if the cranberry sauce on the lettuce leaf held the shape of the can. The United States entered the Second World War on December 8, 1941, following the Japanese attack on the naval base at Pearl Harbor. That same day, Germany declared war on the United States, which meant that the U.S. fought a war on two fronts for the next several years. Almost immediately, men and women of Zion volunteered to serve in the armed forces, continuing to do so until the end of the conflict. One hundred twenty-seven men and women from Zion’s served in the Army, Navy, and Marines during the war, with three of them making the ultimate sacrifice. Throughout the conflict, Reverend Harry S. Kehm corresponded with the soldiers and sailors, providing a report to the Consistory each month with a cumulative total of letters sent and received. Sending these letters cost money, as did the Christmas packages sent to the troops each December. In addition, for the duration of the war church members in the service of our country did not have to pay “church dues” (in other words, they would remain on the rolls as church members even though they did not contribute financially to Zion’s operations). To raise money for these expenses, in 1942 the Consistory authorized holding a peach festival that August “to help defray the expense of the testaments sent out to the members of the church who are in the armed forces of our country.” The peach festival joined the Annual Roast Beef Dinner (held by the Consistory each fall) and occasional Ham and Egg suppers in the spring as food-based fund raisers for Zion’s during the early 1940s. 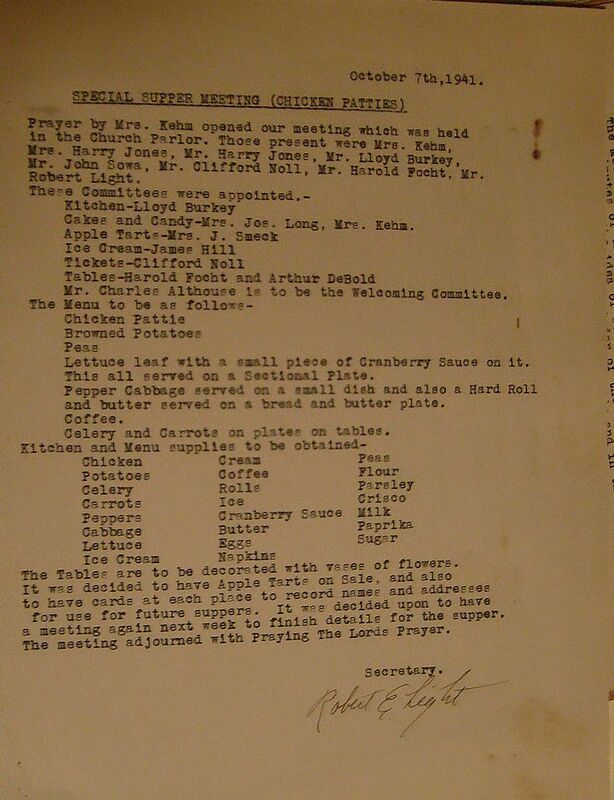 Consistory minutes also reveal the menus for these dinners; the 1942 Roast Beef Supper, for instance, included roast beef, mashed potatoes, stewed dried corn, canned peas, pepper cabbage, celery and carrots, bread and butter, and coffee, with ice cream and cakes available for sale. In February 1944, the Fastnacht Bake and Sale generated over $200 in profit. Dinners also funded other activities. A Ham and Egg supper in April 1940 raised funds to pay down the church mortgage (which would be paid off by 1947), and the one in April 1945 contributed toward the Building Fund. 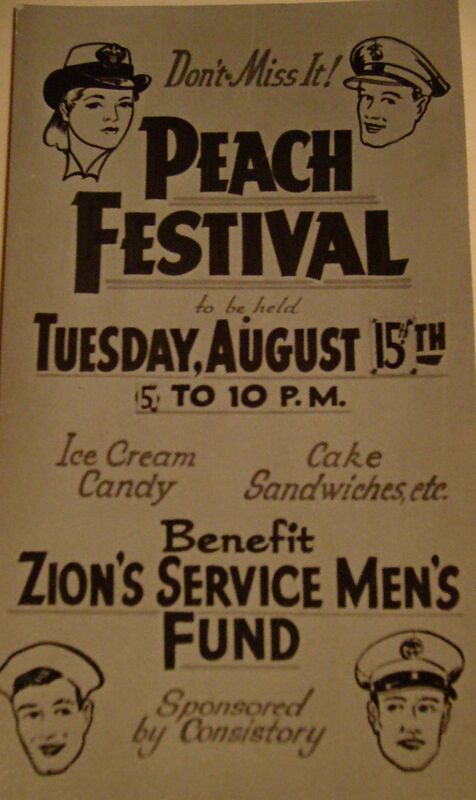 Of course, by April 1945 the war was winding down, but Zion’s still held its peach festival that August. My mother (whose only brother enlisted in the Navy in September 1943 and was stationed in Japan) still remembers the Peach Festival held on Tuesday, April 14, 1945, as one accompanied by church bells ringing and Reading citizens shouting in the streets—because it was held on V-J Day. The past couple of weeks were spent preparing for the Faculty Work-in-Progress Speaker Series talk, working with the bound volumes, and sorting the file folders. The bound volumes actually involve more cataloguing than filing, although there are still some loose pages inside the bound volumes that are being placed in file folders. The turnout for the talk wasn’t too large, but I did film it, and there has been some interest in watching the video (if you’re interested in watching it, send me an email at kguenthe@mansfield.edu, and I’ll send you the links). 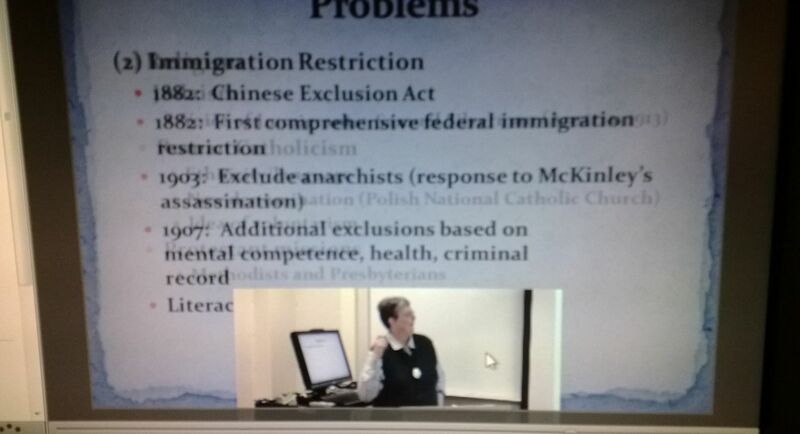 Of course, my mother (aka “research assistant”) watched it, and she pointed out an error I made in the presentation. 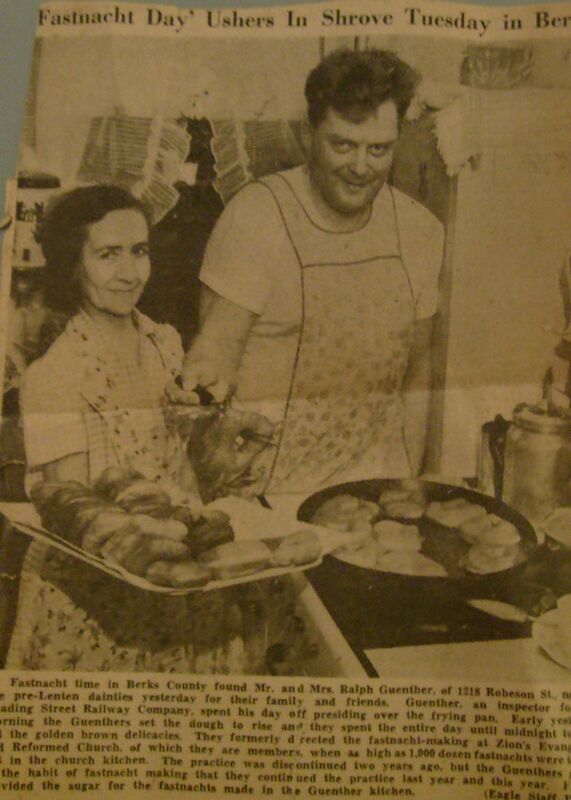 Apparently they did all the fastnacht baking and sales at my grandparents’ house in Reading…and it reeked of fastnachts for six months afterwards (and no, while fastnachts are like doughnuts, they are fried in lard—and it’s not exactly an aroma you want as an air freshener). 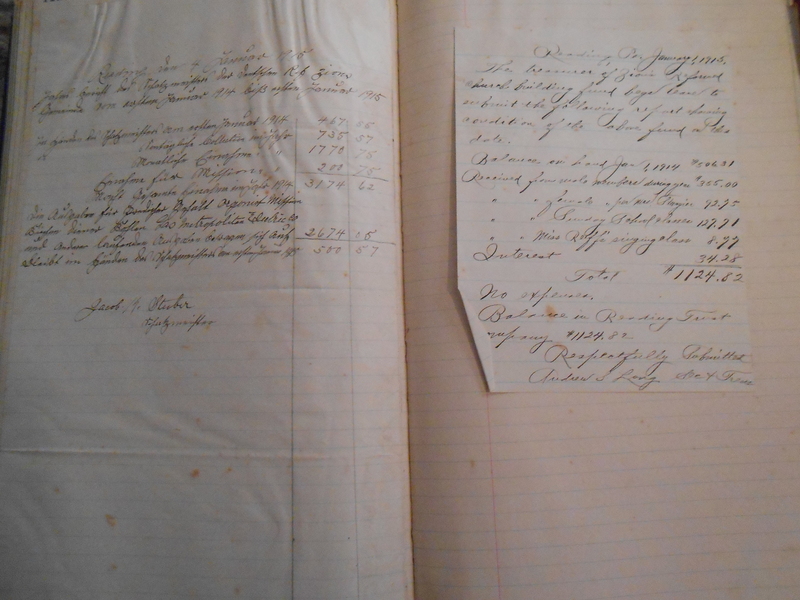 The bound volumes include the church registers (baptisms, confirmations, marriages, deaths, transfers), along with Consistory (church council) minutes from 1881 through 1939. The first 35 years (1881-1916) of the Consistory minutes are recorded in German…the lovely schriften that makes reading doctor’s prescriptions easy. The church registers are also in German during this period, but I know enough German to figure out months without resorting to a dictionary. For the Consistory minutes, not only do I need a dictionary, but I also need a “cheat sheet” to decipher the script (check out the difference between ‘e’ and ‘n’ on the sheet). The sorting part is the most fun. Once again, I’ve set up tables in the garage for the piles…except instead of dealing with 80 degree temperatures like in September, it’s now 40 degrees in the garage. This means, of course, that wearing gloves becomes important to keep my hands warm in addition to handling the documents. And, of course, warm clothes to keep me warm…and the classy hat to keep my ears warm. This week (actually, Monday, October 21) is Fall Break. For my colleagues who are teaching this semester, midterm grades are due, and, when I was at the Pennsylvania Historical Association annual meeting this past weekend, the main topic of conversation was how many papers everyone had to grade (no, I didn’t feel guilty that I didn’t have any to grade, and yes, I did mention I was on sabbatical this semester). It’s also the week that I must present a progress report—just like my sister the 2nd grade teacher and sister-in-law 1st grade teacher must do, except in my case it’s a progress report on what I have accomplished to date on my sabbatical. On Thursday, October 24, from 12-1, I will be making a presentation as part of Mansfield University’s Faculty Work-in-Progress Speaker Series: “Getting My Hands Dirty Doing Primary Source Research: Adventures in Organizing Church Records.” It definitely will be a work in progress, as I certainly haven’t finished organizing the records…or doing the primary source research. If you’re in the area, drop by Alumni 317 to see photos (I will be using PowerPoint in my presentation) and be entertained by what I have found. I promise not to pass around a collection plate for donations. Because of the conference, I didn’t spend as much time playing with the records as I usually do. However, I have finally unpacked the last of the tubs (well, I had unpacked it previously, then repacked it…so now it’s unpacked again). 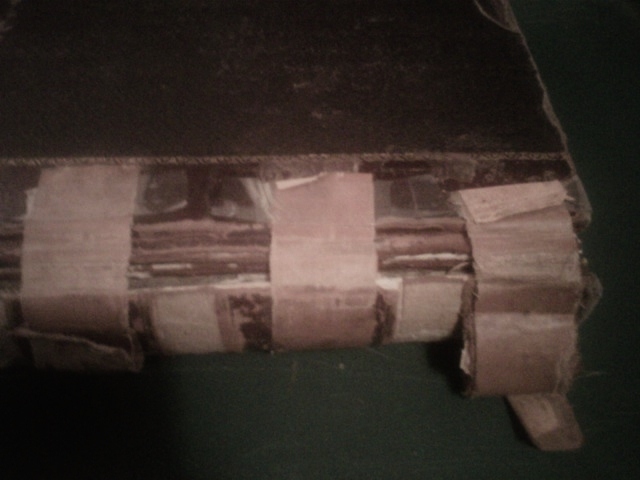 This is the one with the really old stuff: photos of the first church (and its interior), church records in German (and English), membership books from the 1920s, etc. It’s the tub that has the materials that I used when writing the paper on the origins of Zion’s German Reformed Congregation that I presented at last year’s Pennsylvania Historical Association annual meeting. And it’s the tub where I do have to wear gloves when handling the bound volumes because of their fragile condition, especially the one with the baptisms, deaths, confirmation records, etc. Overall, I am beginning to enter the “home stretch” of the records processing; the next step will be taking all the file folders and stacking them into piles for the different categories, then boxing them. While I’m at it, I plan to note which materials will be useful for writing the congregation’s history and which ones can be deposited in Lancaster sooner rather than later.